I work as a professional photographer and spend most of my time on the road with National Geographic and Lindblad Expeditions. When I'm not traveling for work, I spend my free time exploring big mountains around the world. 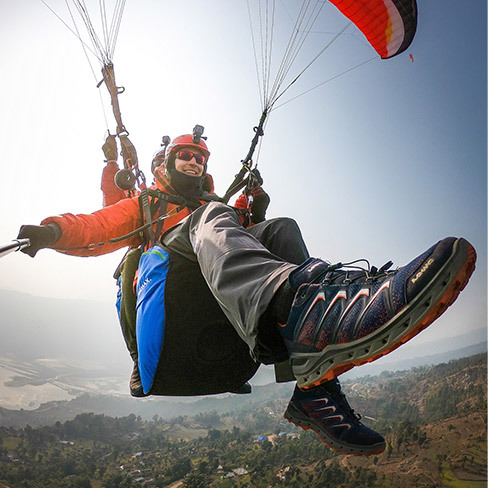 My passions include rock climbing, paragliding, trail running and mountaineering, and often times I will try to combine disciplines on a single expedition to enhance the adventure. There is no greater feeling than summiting a big peak with a paraglider in my pack after a multi day expedition, and flying off the top to glide safely back to the ground in a matter of minutes! After climbing Mardi Himal in Nepal and hoping to fly off after one night in the mountains, I was stuck in a huge storm for four days and spent most of that time sitting in the tent, developing a new respect for patience. The morning of the fifth day, the clouds parted and I launched first thing in the morning and had one of the most beautiful and peacefulsunrise flights of my life.